SOLD in 1 week for $97,000 over asking ($1,075,000)! Very rare opportunity to live in a duplex style RANCHER in a prime Burke Mountain location nestled between two greenbelt creeks! The main floor has a soaring 14' ceiling, entertainers dream kitchen with granite counters, big island, high end Samsung Fridge & Stove and Bosh Dishwasher. Gorgeous laminate flooring throughout the main. Cozy gas fireplace in Great Room. The open layout leads you to a massive south facing covered deck. The Master on the main has a decadent ensuite and door to the deck. The lower level has a unique 11' ceiling and two big bedrooms with laminate floor. One bedroom with a slider to the walk-out patio and yard. Huge Rec. Room. Bonus, large storage area that can easily be converted to a media room. 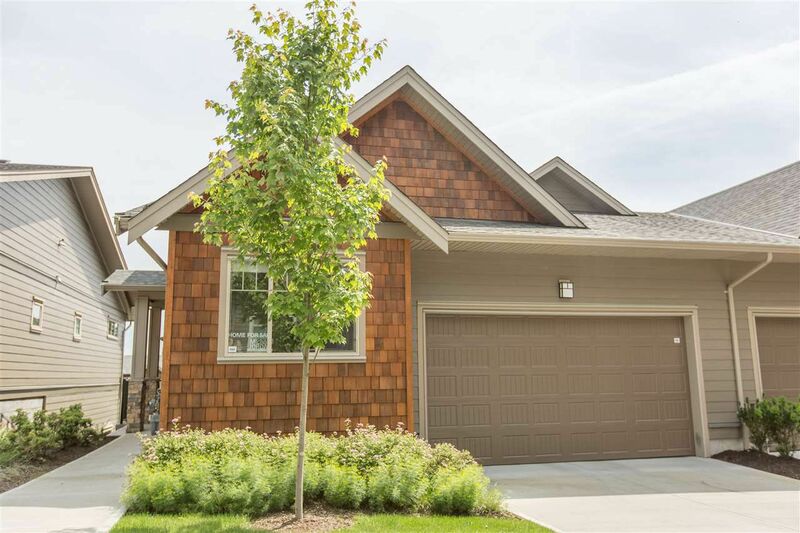 Each home is outfitted with premium craftsman architectural features such as custom stonework, quality West Coast cedar and timber accents, and fiber cement siding (Hardie board siding). Inside, this home has been designed to take advantage of the southern exposure and maximize light with large windows and a vaulted ceiling. There is also the luxury of stepping out onto a sunlit deck to enjoy the natural creekside surroundings and fenced yard with lush landscaping. A home at Secret Ridge allows you to have a close connection with nature without having to give up the convenience of the amenities that are important to you. the top brands in fashion and electronics. • Take courses at Douglas College or visit the Evergreen Cultural Centre - it’s all so close. • Board the new Evergreen Line or West Coast Express to explore Metro Vancouver – just 5 minutes away. • Walk to Lafarge Lake Park to fish, or have fun on one of its sports fields or playgrounds. In addition to the great shops and amenities that are already here, so many more exciting things are coming to The Foothills. A new retail village is being proposed for Partington Creek, just east of Secret Ridge, where you’ll be able to browse the local bookstore or meet friends at the new cafe. Plans for eight new schools are underway - from elementary to high school – which will give the area’s smallest residents a variety of educational options. As well, the entire neighbourhood has plans to join its network of trails, both paved and forested, to create a great cycling or strolling experience for all residents. With all this to offer, Secret Ridge is a great place to call home – whether you’re drawn to the area for the recreation or the culture, the seclusion or the city. Too many features to keep secret. Homes at Secret Ridge were available in three thoughtful layouts, with a choice of a four or five bedroom home with a dual master, or a master bedroom on the main level design. 25 customizable options to choose from, including two designer colour schemes of Classic or Contemporary, which will allowed owners to create the home of their dreams. Each home features a spacious fenced yard, a double-wide attached garage and plenty of sunshine from its terraced, south-facing design. PERSONAL TOUCHES: With over 25 customizable options, including two designer colour schemes of Classic or Contemporary, there are countless ways to let your individual style shine through. DESIGNER KITCHEN: With so many quality details, your new kitchen will be a space you’ll savour. Maple or white wood shaker cabinets include soft-close drawers and doors, a pantry, and a central kitchen island with storage below so you’ll never run out of cupboard space. Granite countertops and under cabinet task lighting will make preparing meals as enjoyable as eating them. SPA RETREAT ENSUITE: Your master ensuite is inspired by a five-star spa retreat. Run your fingers along the smooth granite, take in the beauty of the large-format polished porcelain tiles or immerse yourself in the deep soaker tub. When you’re done, enjoy even the littlest of luxuries like the ensuite’s linen closet and a shower with rain shower head. VAULTED CEILINGS: Homes at Secret Ridge are designed to be bright and airy with an effortless flow from room to room with 9-foot ceilings throughout main floor (in most homes), and soaring vaulted ceilings in the entries (except in home A2) and living rooms. STORAGE: We all need it, and the homes at Secret Ridge have it. Whether it’s the boxes of holiday decorations or the endless amount of sports equipment, your new home at Secret Ridge won’t make you leave your favourite possessions behind. DOUBLE-WIDE GARAGE: Each home at Secret Ridge offers a convenient attached double-wide garage. A YARD FOR EVERY HOME: Have extra room for festive summertime barbecues; or let the kids and pets play in the fresh air within a secure, fenced yard. SOUTHERN EXPOSURE: Soak up the warmth from the southern exposure on spacious decks off the living room and in well-lit rooms while you curl up and relax with a favourite book. MAINTENANCE-FREE LIVING: Your outside maintenance is all taken care of, leaving you free to travel or enjoy time with loved ones, knowing your home will always look beautiful and cared for. Quality materials and decades of expertise go into building your new home at Secret Ridge. No small detail is overlooked and our Inspired Green® approach to building is always top of mind. “The structural design at Secret Ridge is such that is gives the homeowner the greatest wall-to-wall span. The way the beams and floor systems were engineered minimized the need for many posts or demising walls in the basement, which gives these homes an extremely open feeling. This structural design also allows for generous ceiling heights. Homeowners will enjoy vaulted ceilings in the living area and entrance. - Gerald Heinrichs, President of MGC Construction.